Jan. 3 Update: Forecast highs and lows (dotted lines) added to daily temperature chart. Today's updated extended range (2-week) forecast, shown above, from the Climate Prediction Center continues to indicate the probability of cooler than average temperatures in the Mid Atlantic region for the week of January 10 to 16. The prediction calls for a 40-50% chance of cold temperatures during that period centered one week before the Presidential Inauguration. 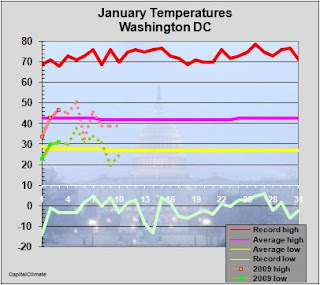 Climatological average temperatures for mid January in Washington, shown in the chart to the right, are a high of 42° and a low of 27°. For precipitation, there is a 33-40% chance of drier than average conditions. Probabilities of relatively dry weather are 33% or greater for the entire contiguous 48 states, except for the upper Midwest and northern Plains. Click here for all Inauguration Weather posts. This year is the 100th anniversary of the great Presidential Inauguration forecast bust of 1909. 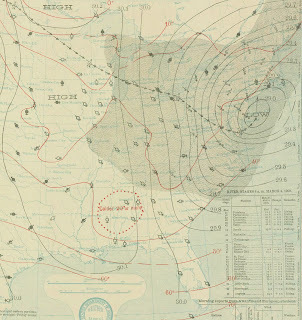 The history of weather forecasting is replete with major errors, but few can compare with the spectacular public embarrassment of the forecast for the inauguration of President Taft on March 4, 1909. On Inauguration Day, under the headline, "A FAIR INAUGURATION DAY", the New York Times reported on page 1 that "clear skies and bracing temperature" were forecast. Weather Bureau Chief Willis Moore said, "It will be a clear day with plenty of sunshine and invigorating air. The temperature will range between 35 and 40 degrees, and every indication points to the best weather conditions." The forecast was made in spite of the fact that heavy rain had moved into Washington the night before and turned to snow with high winds. The Times noted that the storm had driven "more than 100,000 inauguration visitors from the slush covered streets and avenues." 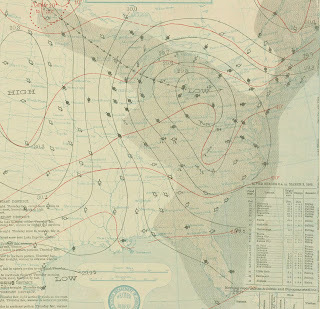 By extrapolating current trends, the forecasters were counting on the storm, which had rapidly moved in from the west, to continue eastward, followed by clearing high pressure. In fact, the storm slowed and strengthened off the Mid Atlantic coast, bringing heavy snow to much of the region. As a result of the storm, the swearing-in ceremony was moved inside the Capitol for the first time since the second inauguration of Andrew Jackson, although skies began to clear as the new president left for the White House. The parade was held as scheduled with "crowds which stood unmindful of the ankle-deep snow and slush about them," as the Times reported the next day. On the greatest day of its last four years Washington was almost completely isolated, so far as telegraphic or telephonic communication with the rest of the United States was concerned. The storm played the worst kind of havoc with all wires. For many miles between here and Baltimore and other cities to the north both telegraph and telephone wires gave way under the mass of sleet and snow that clung to them, and poles were broken by the high wind. The day after the inauguration, Prof. Edward Garriott, official forecaster of the Weather Bureau, gave the rather lame explanation, "It was a 'flareback' from the storm which had passed off the coast of Long Island some hours before, and therefore could not have been foretold by weather forecasters." Weather Bureau Chief Moore, who had been in office since 1895, was fired by the president right after the inauguration, but it was the following inauguration of President Wilson in 1913. More about that event in a future post. 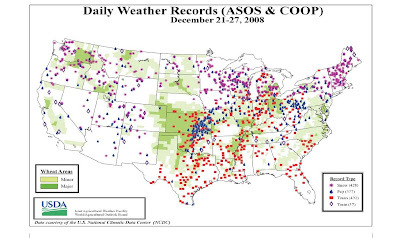 Recently, we noted the remarkable number of high temperature records set over a large area of the U.S. Meanwhile, Tim Lambert at Deltoid was pointing out the pimping of the snow records being set, particularly in the Pacific Northwest, by the Drudge-amplified deniosphere ("Denialists scraping the bottom of the barrel"). Here's a map from the latest edition of the U.S. Dept. of Agriculture's Weekly Weather and Crop Bulletin that puts the whole thing nicely in perspective. Note that the number of high temperature records (432) not only exceeds the number of snow records (428) by a little, but it also completely annihilates the low temperature records (a measly 37). Furthermore, the week shown ends on Dec. 27, but more high temperature records were set further to the northeast on the following day. For more analysis on this subject, see "Shoveling Out From a Snow Job". The current extended range temperature forecast, shown to the right, indicates a 40% chance of below-average temperatures in Washington for the second week of January. If similar conditions prevail for the Inauguration a week later, what would that imply for temperatures? The chart of January 20 high temperatures from 1930-2007 shows that, on average, the most likely temperature range is 35-39° (22%), followed by 40-44° (21%). This is the case even though the average is 41.8° because the distribution is skewed toward higher temperatures. The overall maximum was 70° in 1951 (not an Inauguration year). This is also the all-time high for the date. The next highest value, however, is 60° (1952, 1954, and 2006). Altogether, these are the only 4 instances in the last 78 years in which the high exceeded 59°. 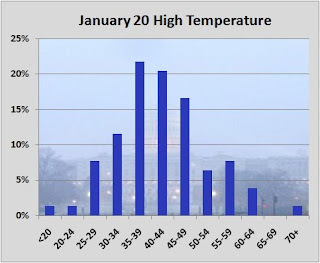 Click here for previous Inauguration weather posts, including a year-by-year chart of high and low temperatures and precipitation. Inauguration Day, January 20, is now 3 weeks from tomorrow. That's beyond the range of accurate daily weather forecasting, but general trends are at least beginning to emerge for the early part of January. December's temperatures have averaged near the long-term "normal" in Washington, DC; they're now just 0.2° warmer than the 30-year mean. However, they've gotten there the hard way. Within the past week, temperatures have been as much as 16° below average (high of 28° on the 22nd) and also as much as 23° above average (high of 70° yesterday). The latest extended-range forecast from the National Weather Service's Climate Prediction Center calls for nearly equal chances of above or below average temperatures in the Mid Atlantic region for the 6-10 day period Jan. 4-8. For Jan. 6-12, however, below-average temperatures are more likely. Stay tuned; the first extended range forecast to include Inauguration Day will be issued a week from tomorrow. Click here for previous Inauguration weather posts. Record High Temperatures in Midwest and Eastern U.S.
PM Update (12 pm): Added December 28 high temperature map and records for locations in the states of Indiana, Illinois, Kentucky, Missouri, Arkansas, Oklahoma, including some records from December 26. The Weather Channel reports on the air that at least 75 high temperature records were set Saturday and Sunday, December 27-28. In Washington, persistent clouds kept the high of 70° from reaching the 1946 record of 75°, but the record high minimum temperature of 50° for the 28th (dating back to 1881) was tied.